Martinez and Stager provide K-12 educators with the how, why, and cool stuff that supports making in the classroom, library, makerspace, or wherever learners learn. 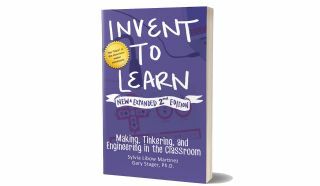 In a newly expanded of edition of their book, Invent to Learn: Making, Tinkering, and Engineering in the Classroom, educators Sylvia Martinez and Gary Stager capture the excitement of the maker movement and share the educational case for bringing making, tinkering and engineering to every classroom. "The bible of the maker movement in schools" includes new coverage of the BBC micro:bit, lasercutters, Scratch 3.0, littleBits, Hummingbird robotics, equity issues, and lessons from schools around the world. In this practical guide from Constructing Modern Knowledge Press, Martinez and Stager provide K-12 educators with the how, why, and cool stuff that supports making in the classroom, library, makerspace, or wherever learners learn. As schools embrace exiting new tools like 3D printing, microcontrollers, Arduino, wearable tech, robotics, and coding, Invent to Learn: Making, Tinkering, and Engineering in the Classroom explores powerful new technologies, places them in a historical context, and advises educators on how to create rich learning adventures in their classroom.